learning to drive is mostly exactly the same as it is for everyone else, with a few extra considerations. In your daily life, depending on the severity and nature of your disability, you are used to facing challenges: this is one more, and one which will bring you such pleasure as you experience the joy of the open road – as all our successful drivers do – but perhaps our a slightly greater appreciation of the independence being a driver brings. Don’t be put off by the idea because it seems too difficult: millions of disabled people are learning to drive and have passed the tests. There is plenty of help out there from disability organisations and the Government. Get as much advice as you can, talk to health care professionals about your abilities and they will put you in touch with disabled organisations. The minimum age for most people is 17, but if you get Disability Living Allowance at the higher rate which includes the mobility component, you can drive at 16. You may also be able to get financial support for lessons from the Motability scheme if you are between ages 16 and 24. You must tell the DVLA the exact nature of your disabilities. If you already have a licence and your situation has changed, you must inform them immediately – don’t wait until licence renewal time. Some conditions, e.g. neurological conditions, strokes, epilepsy, physical disabilities and visual impairments are automatically ‘notifiable’, but be sure to give as much information as you can. The same rules are included in applications for a provisional licence. Depending on your existing classification for the purposes of the Disability Living Allowance, you may be entitled to a free tax disc. You can apply for an exemption certificate from the agency that issues your benefit. The vehicle must be registered in your name, or in the name of someone you nominate to drive for you. And the vehicle must only be used for your purposes. If it ends up being used by the nominee or someone else for their own purposes, then you will lose the exemption. If you have a vehicle under the Motability scheme, this is sorted out for you. As for all learners, going to a professional Driving school is the best method to use. Many schools have instructors who have the extra technical skills and understanding to help you get on the road as quickly as possible. If you have an unsympathetic instructor, go to a different school. Their experience is very useful for issues such as getting in out of the car by the most efficient method, handling a wheelchair if necessary with minimum fuss, and of course, helping you with any extra aids or adapted controls. You may have to make adjustments to their existing vehicle, or can apply for one through the Motability scheme. It is sensible to advise the DSA of your specific needs when you apply for your test. Most public buildings (which include test centres) now have full disabled access by law. If you are unable to attend the local centre, then arrangements can be made for you to take the test at home. If you are deaf or hearing-impaired, arrangements can be made to watch the relevant video part of the test with sign language. You take the same test as able-bodied drivers, but again, you need to let the DSA know of any special requirements when you book your test. Driving examiners have been given training to understand the particular needs of various disabilities. Be open about what you can and can’t do. 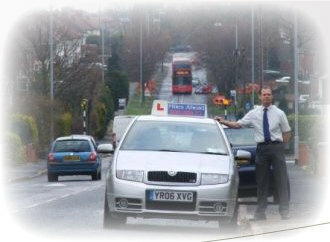 Your driving instructor would not have advised you to put in for your test if he/she thought you weren’t capable. If you suspect you are being discriminated against by the examiner, report him/her to the DSA. Once you are safely behind the wheel of a car, you will experience freedom from what is for many, a previously quite restricted situation. When driving long distances, like other drivers, you need to take a break now and then. Most motorway services now have excellent access and disabled parking. You should apply for a Blue Badge which gives you free parking. Of course there are places (e.g. leisure centres, supermarkets, places of entertainment) which have their own designated disabled bays. These are controlled by the site owners but sadly are open to misuse. If it is impractical to complain there and then, ring the relevant owner and let them know. Make sure you keep your Blue Badge safe – unfortunately there is now a strong ‘black market’. When you leave it on display, be extra careful that the vehicle is secure and the badge is not easily dislodged. And remember to do your homework if your new freedom allows you to drive to places you have never been before. Check out beforehand where the disabled parking is, what facilities the town is – with a small amount of planning, you can be free to go where you wish! Miles Ahead Driving School doesn’t provide driving lessons for disabled people (unless you are OK in a standard car)-for now-but may do so in the future. However, if you are a disabled person and you need any information or advice on learning to drive, please fill out our contact form and will replay back to you within 48 hours.